Wow! What a ride it has been. And to top it off, I was blessed with this perfect last sunset on Route 66 (in Illinois, the land of the great Abraham Lincoln), with which I will “officially” end my little photographic Route 66 series. As I watched the sun drop behind this barn on Sunday evening, and watched (and listened to) the flocks of geese flying above (perfect timing), I reflected on all I had experienced during this little adventure: the rugged road, the amazing towns, the still of the desert, the songs in the diners, and most of all the many wonderful people I’ve met along the way. God Bless America, the land that I love! Justin – I really enjoyed this series! I’m gonna miss it. Jan Winther – Incredible shot, wow. Bob Lussier – Great capture. I hope you have a backlog of images from your journey to share in future posts. Edith Levy – Wow just incredible. Len Saltiel – Wonderful composition and light Jacques. Must have been a great adventure. Jim Denham – Great series and wonderful finale Jacques! What a great adventure! Scott Ackerman – Beauty! Congrats on an amazing capture man. Wayne Frost – Awesome image, Jacques. 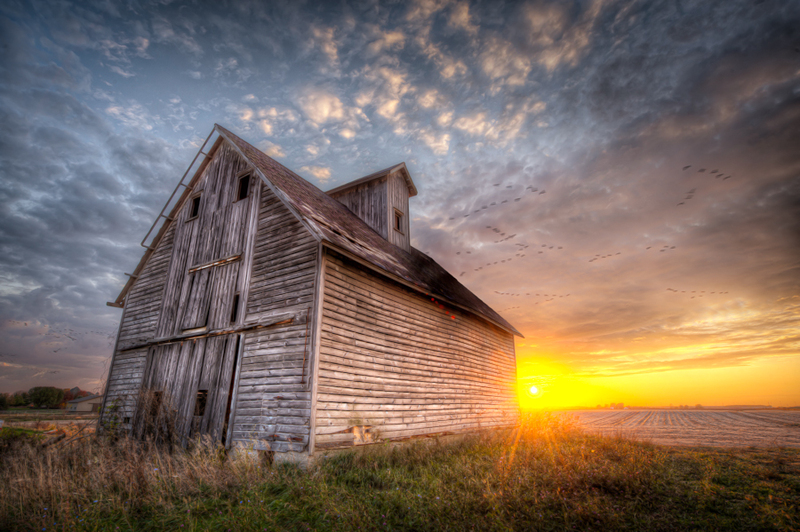 The sun rising over the distant horizon, the birds flying in formation, the tilled field behind the weathered barn. I am looking forward to many, many more views through your eyes now that you are back home in the U.S.
Eric – fantastic series, and beautiful shot to end with! bob emmerich – Super series. Jacques – I’m really overwhelmed by l the wonderful comments from all of you. I’m so glad you all enjoyed this little ride-along on Route 66 with me. Rest assured, I have so many more cool shots from this trip to share, which I’ll intersperse with my other work here and on Google +. Toad Hollow Photography – A GREAT shot of an iconic roadway, Jacques! Love the sunflare as it beams from the edge of the old building there. GREAT textures and details, definitely a most wonderful picture, my friend!